Global marketing research solutions provider Civicom® will host a webinar on effective message testing using online market research tools and methodologies. The webinar will be available in several time zones on April 17 and April 19, 2018. The upcoming webinar entitled “Tell Me A Story: Take Your Message Testing to A Higher Level” aims to empower market researchers and maximize key insight discovery by leveraging the full potential of web-enabled or online in-depth interview and focus group solutions. The webinar will present several examples of how to use the flexibility of web-enabled tools to engage more productively in storyboard creation in an online in-depth interview setting. Attendees will be able to experience how researchers are able to present multiple messages to respondents while enabling respondents to identify their preferences and build storyboards in a web-enabled interview. Webinar participants will be able to see how this approach captures the essence of the story telling trend. Civicom Marketing Research Services has always operated as an advocate of bridging the gap between researchers and respondents by continuously developing and innovating telephone and web-enabled market research services. With years of global and online market research service expertise under its belt, Civicom will be tackling the strengths of the online interview setting and how researchers can fully utilize Civicom’s powerful telephone and web-enabled marketing research solutions for discovering insights, specifically through complex message testing. 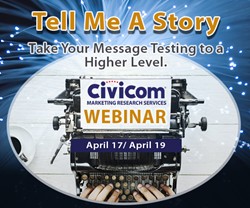 The webinar “Tell Me A Story” is a not-to-be-missed webinar where Civicom, expert provider of online marketing research services, will tackle how market researchers can elevate the process of message testing effectively in order to gain significant, quality insights. Annie McDannald, Global General Manager of Civicom Marketing Research Services, has extensive experience in facilitating online marketing research projects for various kinds of insight professionals and niche markets. She will be providing her insights on opportunities for researchers to make the most of storytelling trends in web-enabled interviews while gathering quality responses and ultimately attain project success. Civicom Marketing Research Services offers many options to enhance the research process for marketing research professionals. Civicom is the global leader in facilitating telephone and web-enabled IDIs and Focus Groups using Civicom CyberFacility®. Civicom also offers Civicom Chatterbox®, an asynchronous research platform for online communities and bulletin board studies that operates globally and is available for individual or multi-country studies, plus the Civicom ThoughtLight™ Mobile Insights App, a mobile qualitative tool for collecting richer in-the-moment insights, and offering geolocation plus off line accessibility for places where there is no data connection. Civicom operates in over 96 countries and offers extensive translation services for marketing researchers, as well as transcription services through TranscriptionWing™, plus respondent recruiting through CiviSelect™. All of these services are available in Spanish, as well as English, and multiple other languages. Additional services include Civicom FrontRow™ Mobile Ethnography, and See Me Navigate™ for assessing mobile usability, enabling researchers to view a respondent’s mobile device remotely through online technology to conduct mobile app and mobile web usability research while the respondent engages with their mobile device.